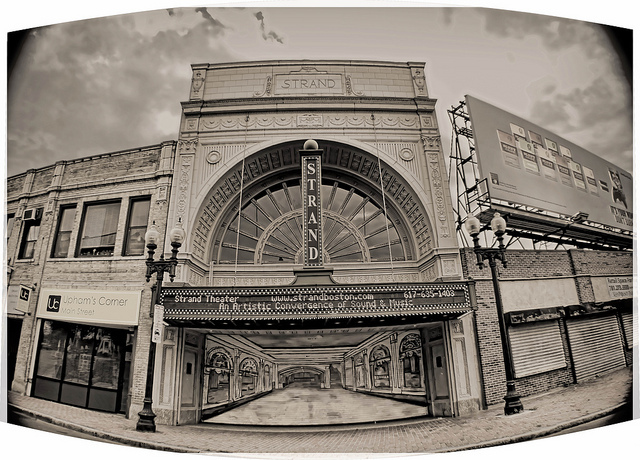 To attract audiences to Dorchester’s Strand Theater, its promoters pulled out all the stops. The “Multi-Million Dollar Palace,” had mirrored foyers, marble and bronze interiors, electric, crystal chandeliers, an organ to accompany silent films, and a fountain filled with beach pebbles, plants and rare fish. The building was one of the first theaters built for the movies. For its opening night gala, on Armistice Day, November 11, 1918, The Boston Globe reported the theater was lit with celebratory red, white and blue bulbs. Hundreds gathered for tickets, dressed in their formal best. The bill included Annette Kellerman in “Queen of the Sea” and the charming stage and screen actress Marguerite Clark in “Out of a Clear Sky.” Clark plays a Belgian countess who runs away to America to escape a marriage to a German prince. During intermission, a twenty one piece orchestra played dance tunes for the crowds. In its heyday the Strand hosted a parade of familiar faces. Dorchester native, Ray Bolger debuted on its stage in 1922. Fanny Brice, Alfred Hitchcock, Milton Berle, Jack Benny, Duke Ellington and Jerry Lewis, are also said to have appeared there. Closed in the 1960s, the theater was claimed by the city under eminent domain in the 1970s and underwent extensive renovations. Today it is open as an arts and community center. This entry was posted in Architecture, Dorchester, Music&Art and tagged Armistice Day, Boston, Marguerite Clark, Movies, Ray Bolger, Strand Theater, Upham's Corner, WWI. Bookmark the permalink.